When it comes to home inspections, the bare minimum means you might not get the best, most detailed report. Skimping on the home inspection can ultimately cost owners thousands of dollars from unidentified flaws, damage, or potential liabilities once you have the keys in hand. And, once a property is sold, your options can be limited. Our home inspectors have been doing thorough, detailed home inspections in the St. Louis area since 1985. We pride ourselves on our educational approach to the inspection and helping our customers understand the condition of their new home. Our customers have responded with overwhelmingly positive reviews. The cost of purchasing a home is so much more than the list price. The number of fees and payments involved in buying a property can give new homeowners a bad case of sticker shock. It might be tempting to cut corners and choose your home inspector based solely on price. But like with just about any other service, when it comes to a home inspection, you get what you pay for. Trying to save a few dollars upfront might end up costing you thousands in unforeseen repairs and damage. The American Society of Home Inspectors® sets the minimum standards for home inspections. Home inspectors who are licensed and members of ASHI adhere to these minimum standards when they complete an inspection. 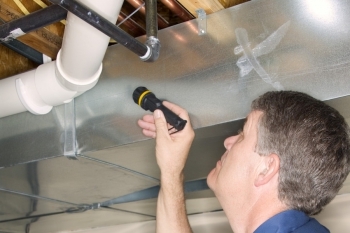 However, there is much more to a home inspection than just looking for the bare minimum. A more meticulous home inspector may find things that someone could miss with a quick walkthrough. As a company, we have many unique features that set us apart from other inspection companies. Our National Institute of Building Inspectors® train home inspectors to take the time necessary to do a thorough, on-site inspection. And, we stand behind the accuracy of our findings with our Limited Repair Reimbursement Guarantee* to protect our customers against unexpected repairs on the eligible element. The Guarantee varies from state to state, and in St. Louis is good for up to 1-year. This Guarantee is not a 3rd party program and demonstrates our dedication to excellence for every customer. We also offer many online services such the HouseMaster Cloud® and the Inspection Resource Guide®. Taking the extra time needed and standing behind the quality of our service not only means you’ll receive a report that’s detailed and thorough, but you’ll have all your questions answered as well. After walking through a home with a realtor or with a seller, you might walk away with the impression that the property is practically perfect. The reality is that paint, fixtures, flooring, and other cosmetic features of a home may not tell the whole story. A home inspection can be an intimidating process. And while a professional home inspector will point out the good things in the home as well as the not so good, most buyers will understandably focus on the issues. However, when you read your final report, don’t panic. It’s our job to help you understand overall condition of the home. All homes have positives and negatives. Our job is to give you the information you need to consider both and make give you a realistic expectation of the road ahead. Armed with your inspection report which is complete with digital images of conditions found, you can use the information to negotiate for major repairs, ask for credit or a dollar amount off the purchase price, get estimates and quotes for repairs, or even plan out future maintenance. For instance, if you know your water heater is 10-15 years old, you can plan on replacing it in the near future. Or, if you are buying an older home you may have to plan for more significant upgrades such as older plumbing, outdated wiring, or even potential asbestos containing materials that may require special abatement. Armed with this information you can consider these costs as part of your overall home ownership budget. The most important point being that you won’t be surprised once you have the keys in hand. Ready to experience the value of a home inspection yourself? We proudly serve the people of St. Louis County, Chesterfield, Ballwin, Eureka, Ladue, Clayton and neighboring communities. Click here to schedule your home inspection with us, and we’ll be in touch soon. *Where permitted. For more information, review terms and conditions of the Limited Repair Reimbursement Guarantee.